When the government of Israel transacted a deal with Hamas via various intermediaries for the release of a young Israeli captive Gilad Shalit in 2011, we felt something seriously wrong was being done. We were careful in what we said and did throughout the debate about what Israel should do to secure Shalit's freedom. 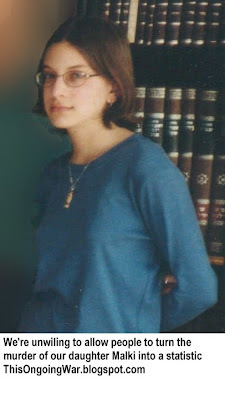 Even so, we publicly expressed the deepest revulsion at the idea that one specific woman in particular, the main planner, executor and mastermind of the massacre that took the life of our fifteen year-old daughter Malki, was among the convicted murderers and terrorists to be unjustly freed from Israeli prisons. We pointed out that she represented less than one tenth of a percent of the people on the list, and that removing her from it was essential to preserving a semblance of dignity for the victims (ourselves among them) and some respect for basic notions of justice. Taking her off the list would certainly not have endangered the completion of the deal to get back Shalit. The woman was not only an unrepentant murderer convicted in court on her own admission. She was also an outspoken advocate for the idea that the killings she planned and executed were right, that she would do the same again if the opportunity were given to her and that others ought to emulate her actions. In short, the very last sort of person to allow back out onto the streets and airwaves of the jihadist world. She walked free along with 1,026 other imprisoned terrorists in 2011. She now lives in total freedom a few dozen kilometers from us, on the other side of Israel’s border with Jordan. She speaks regularly and often about the righteousness of her path, in favour of additional jihadist murder of Jews and Israelis, and in support of the terrorists still held in Israeli prisons. She is married, and travels unhindered throughout the Arab world, addressing large crowds, being interviewed on popular TV programs, and appearing in her own weekly show that is beamed throughout the Arabic-speaking world by the Hamas-owned Al Quds TV channel. It is difficult if not impossible to think of a historical precedent for a convicted murderer, entirely unrepentant, filled with self-justification, released with the agreement of her jailers to go on to a career of encouraging the serial repetition of the heinous crimes of which she was convicted. If any of our readers can think of one, please tell us. She is certainly not the only one of the thousand-plus terrorists released and promptly recycled into active jihadism. One by one, graduates of the Shalit Transaction have been re-arrested by Israeli authorities [see for instance our posts here from February 2012, March 2012, April 2012, May 2012, June 2012, September 2012, October 2012, March 2013 and others] and a handful of their back-stories have come to light. What will be done with them now that they are back behind bars remains unclear. In principle, according to what we were told by official channels when Israel set them free in 2011, any sign of their returning to terrorist activity would render them liable to at least serve the remaining term of their prison sentences; and perhaps more on top of that, given the new charges facing them. So far, we are not aware that this is what was done to any of the miscreants freshly re-captured. So here we are nearly two years after the Shalit Transaction and both of the Palestinian Arab statelets. the Hamas one and its perpetual rival, the Palestinian Authority headed by the ‘moderate’ Mahmoud Abbas, are calling repeatedly and with rising urgency for Israel to release the remaining 4,000+ terrorists from its prisons and/or urging their own ranks to rise up and abduct Israelis so that the unmatched glory moments of the Shalit Transaction can be repeated. 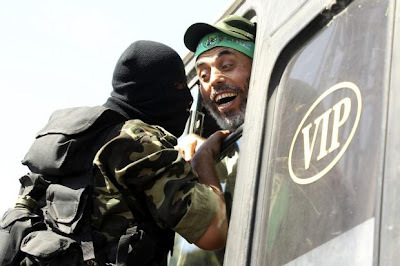 Hamas cut the 2011 deal with Israel and thereby scored a peerless advantage over the Abbas regime. So it’s Abbas who has had to do the fast running needed to try to catch up. As the Herzliya-based Meir Amit Intelligence and Terrorism Research Center points out in a bulletin issued today, the perpetually penniless Abbas regime authorized a $5,000 presidential grant to every one of the freed terrorists, “those who remained in the PA-administered territories as well as those who were deported elsewhere”, ordering up completely free medical care to all the released Shalit Transaction terrorists. Granting all the glory to the jihadist Islamists of Hamas would have been too heavy a political price. Husam Badran (Hamas): Sentenced to 17 years jail in 2004 for his part in multiple lethal bombing attacks, including the massacre at the Sbarro pizzeria in Jerusalem - in the post September 2000 fighting – what we call the Arafat War and others term an intifada – he was released in the October 2011 Shalit Transaction and deported to Qatar. We believe he lives there today. In January 2013, Israeli security forces arrested some 20 Hamas operatives in the area around Hebron. They belonged to a network planning terrorist attacks, with a focus on abducting Israelis to make them bargaining chips for the release of yet more terrorists held in Israeli jails. The plans for well advanced; a ‘safe house’ had been secured, and an Israeli Arab citizen was recruited to be the driver. Weapons were found in their possession, all of them intended to be used during the planned attacks. Most of the members had spent years behind Israeli bars for terror offences. They had relied on contacts with Hamas for support, instructions and funding. Their principal Hamas point of contact was Badran. Bassel Himouni (Hamas): Released in the Shalit Transaction, he was deported to the Gaza Strip and lives there today. In February 2013, Israeli security forces uncovered another terrorist ring in the Hebron area that was functioning as part of Hamas. Headed by Munjed Mousa Diab Juneidi, 23,, they were planning multiple shooting and roadside bomb attacks but were arrested detained before they could put their plans into operation. One of the group was found with a pipe bomb in his possession when detained. The ring leader Juneidi said under interrogation that his Hamas handler was Himouni. Amir Dukan (Originally Fatah; now Hamas): Released in the Shalit Transaction, he relocated to the Gaza Strip where he established ongoing contact with Hamas and other terrorist groups. The Israeli security authorities arrested Amir Barakat, 25, on his February 2013 return from Mecca in Saudi Arabia. Under interrogation, he confessed to meeting there with Dukan, who proposed shooting and grenade attacks in the Nablus area in return for payment of a performance fee of $60,000. Barakat admitted that he agreed with Dukan to do the deal and was trying to acquire a gun. Two brothers from Fara’a, near Nablus, were intercepted by Israeli security in January/February 2013 while attempting to smuggle money from Hamas sources into the West Bank in order to finance acts of terrorism. Detained at the Allenby Bridge crossing, they had €10,000 plus US$900 hidden in cigarette packages. Under Israeli interrogation, they confessed to being in the service of Hamas, and said the money had been passed to them in Jordan from a Hamas source. That Hamas source, again, was Dukan. Hisham Abd al-Qader Ibrahim Hijaz (Hamas): Sentenced to ten consecutive terms of life imprisonment for causing the deaths of ten Israeli civilians and soldiers in terrorist attacks, he was released in the Shalit Transaction and deported to a foreign country. Today he lives freely in Qatar. Israeli security detained a Hamas terror activist, Baker Atallah Samih Sa’ad, in May 2013. Sa’ad was from the Ramallah area village of Mazra'a al-Sharqiya. Under interrogation, he confessed to planning several abductions and shooting attacks. He had been recruited by a man from his village, Hijaz, in Jordan a month earlier: Hijaz. Sa’ad agreed to go to Sudan for military training. Hijaz had told Sa’ad that some time close to the date of the planned attacks, a messenger would deliver four weapons to him. He was also instructed to raise money to fund his own activities. Those activities are now, fortunately, on hold. Ayman Ismail Salameh Sharawneh (Hamas): From Dura, near Hebron, he was imprisoned for multiple offences including his involvement in a May 2002 bombing in Beersheba which injured 19 people (a technical fault prevented the bomb from exploding fully, as we noted here); an attempt to abduct an IDF soldier; and shooting at IDF soldiers. Sentenced to 38 years in prison, he too was released in the Shalit Transaction. At the time, he was called Mahmud Abdallah Abd al-Rahman Abu Sariya. (He has also been called Ayman al-Sharawna Ismail Salma in some reports such as this Israeli one - see page 5.) We posted about him immediately after his re-arrest [see "1-Feb-12: One down, 1026 to go"]. Sharawneh returned to terrorist activity immediately after his release, and was re-arrested on January 31, 2012. The Israeli prosecution asked for the reduction of his prison sentence to be revoked, and for him to return to prison to serve the remainder of that sentence. On returning to prison, Sharawneh undertook a hunger strike which attracted widespread media coverage and sympathy. His argument was that the Israelis had cooked up a bogus claim of his having returned to his terrorist ways, and that this was all wrong and unfair. In March 2013, a deal was agreed by which he was sent to the Gaza Strip for a ten year period of exile, instead of serving the remainder of his sentence. 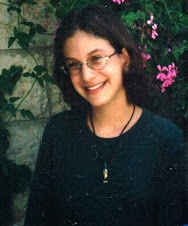 Astonishingly, the request was approved by Israel’s security and legal systems. On arriving in the Gaza Strip, he was given a tumultuous welcome by the Hamas regime and then, on March 18, 2013, interviewed from his hospital bed on the Al Quds television network. In it, he asserted that the only way to release prisoners was by the abduction of Israeli service personnel and that is precisely what he called for. If Sharawneh ever again experiences the misfortune of being arrested by Israel, it’s likely he will be treated as a returning terrorist (this time with clear evidence on the public record as in this Huff Post article) and sentenced to… Or perhaps not, given his amazing track record of getting off the hook until now. Their pre-release imprisonment turns out, in too many cases to have been a small road-bump in a life of terrorism, murder and hatred. The Shalit Transaction has resulted in the idolization of people like Sharawneh who tried - and in his case failed - to execute a random murder of a large number of people, and then outwitted (as they would tell it) the Zionists. And not only their idolization but their transformation into leaders and figures of inspiration. Their lives have become the stuff of legend; their utterances are the fuel that fires the ongoing waves of terror actions directed against Israeli civilians and innocent people abroad. Is it too soon to ask whether the Shalit Transaction was worth all of this?